Before it began, United Nations officials had described U.N. Secretary-General Ban Ki-moon's visit to Burma as a diplomatically risky mission that could end in failure. After it ended, following two days in Burma and two rare and lengthy meetings with General Than Shwe, the reclusive leader of the country's military government, Ban had come away with nothing concrete to show for his venture. His requests to meet imprisoned Nobel Peace Prize winner Aung San Suu Kyi were rejected. His pleas for the government to release its 2,000-plus political prisoners were ignored. "I believe the government of Myanmar failed to take a unique opportunity to show its commitment to a new era of openness," Ban told reporters at Bangkok's international airport Saturday night. Burma, which the ruling junta has renamed Myanmar, hasn't seen anything resembling openness for nearly five decades, having been ruled by military regimes since 1962. Its generals have isolated the country, ground it into poverty and brutally suppressed periodic mass uprisings in support of democracy  the last, in 2007, was led by Buddhist monks who were gunned down or arrested. The regime says it will hold national elections in 2010, but many observers say they are designed to cement military rule under a civilian guise. The democracy movement's leader, Aung San Suu Kyi, has been kept under house arrest for 13 of the past 18 years. The regime has now put her on what U.S. President Barack Obama has called a "show trial" for violating the terms of her house arrest after an American man broke into her home, claiming he had visions she would be assassinated. She faces a five-year prison sentence if convicted. Even Burma's normally circumspect neighbors in the Association of Southeast Asian Nations have criticized the regime over the trial and Suu Kyi's never-ending imprisonment. During his first meeting with Than Shwe, Ban asked for permission to see Suu Kyi. Than Shwe refused. The U.N.'s top diplomat said the success or failure of his mission should not be judged solely on the benchmark of meeting Aung San Suu Kyi, though he lamented that it would have been "an important symbol of the government's willingness to embark on the kind of meaningful engagement" that would lend credibility to the elections. Ban said his mission served the purpose of allowing him to convey what the international community and the United Nations expects from the regime, like progress toward democracy, directly to the country's leader. He said he did this "as strongly as possible, as hard as I could press." He believes, he said, that Than Shwe will "seriously consider" his proposals for making national elections scheduled for 2010 "credible, inclusive and legitimate." Democracy activists remain unconvinced. "The regime thumbed its nose at the entire U.N. system," says Debbie Stothard of ALTSEAN, a Southeast Asiabased network of activist groups campaigning for democracy and human rights in Burma. "It's time for the international community and the U.N. to take off the kid gloves. It's time the international community stopped regarding crimes against humanity, repression and human-rights violations as normal for Burma. The regime didn't fail to take this opportunity, it refused to." Ban's optimism going into last week's meeting probably sprung from his limited success with Than Shwe during a previous meeting in 2008, convincing him to allow outside humanitarian assistance into the country after Cyclone Nargis. But he is far from the first diplomat to fail to persuade Burma's generals to entertain any serious notion of real political reform. 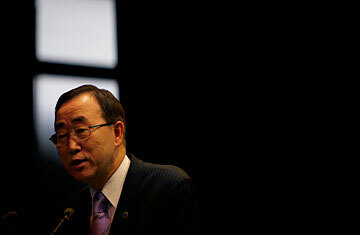 Going forward, Ban said he would brief the U.N. on the visit, and the organization would monitor the regime's progress on his proposals, which he did not outline in detail, save for saying election laws and an election commission should be established, and that all political prisoners should be released and all political parties be allowed to participate in the 2010 polls. Stothard says the regime fears a Security Council inquiry into war crimes and crimes against humanity. Burma has been engaged in a civil war with various ethnic groups since 1948, although some have signed cease-fire agreements with the government. The regime has been accused of torturing its political prisoners. But China and Russia have opposed any Security Council action on Burma. China, which views Burma as a resource-rich, strategically important client state, is seen as the regime's strongest backer in the international community. "It's time China realized that having instability on its border with Burma is not in its best interests," Stothard says, adding that tensions were increasing between the military and ethnic armies in Burma based near the China border. Russia's expanding trade with Burma includes an agreement to sell the poverty-stricken nation a nuclear research reactor, and the regime has also been bolstering ties with North Korea, receiving arms shipments from its sister Asian pariah state, and employing North Korean engineers to build massive underground bunkers at its fortress-like capital of Naypyidaw. Ban stressed that he would remain focused on the situation, and said he expected the government "to demonstrate real progress in the near future." Real progress, however, hasn't been seen in Burma since 1962. And contempt for the U.N. is nothing new among Burma's generals. A Burmese, U Thant, served as U.N. Secretary-General for 10 years, from 1961 to 1971. When he died in 1974 and his body was flown back to Burma, leader General Ne Win, the mentor of current ruler Than Shwe, refused U Thant a state funeral or any honors whatsoever. Read about the 2007 crackdown in Burma.